The Southeastern Anatolian Region has a very rich history and cultural heritage, as can be seen in its magnificent historical sites. Its history begins around 7,000 B.C. in the New Stone Age. Between 2,000 B.C. and 1,500 B.C. came the Hurris who were followed by the Hittites sometime around 1,200 B.C. In the land which encircles the Firat (Euphrates) and the Dicle (Tigris) rivers, lived Abraham, the patriarch claimed by three world religions. Some think that Abraham was born in what is now called Sanliurfa, supposed to have been Ur of the Chaldees, and later moved south from the city to Harran. In Harran, which was an important Mesopotamian historic and cultural center, the ruins of one of the largest and oldest Islamic universities can be seen among the archaeological remains. Restoration of the 18th-century mansion, Küçük Haci Mustafa Hacikamiloglu Konagi in Sanliurfa, is now complete. It has just reopened and now serves as an art gallery. When you travel from the south to the north over the Mesopotamian plains, the first high mountain to be seen is the picturesque Mt. Nemrut, with the mausoleum of the Commagene King Antiochos at its 2,150 meter peak. The most important areas of the region are Diyarbakir, whose city walls are a superb example of medieval military architecture; Mardin with its regional architecture; and Gaziantep, a large trade and industrial center which contains the remains of late Hittite cities. The Atatürk Dam Lake is the region’s holiday and water-sports center. There are many beaches along the shore of the lake which can give you an unforgettable holiday experience under the Mesopotamian sun. The Southeastern Anatolia Project covers the lower parts of the Firat and Dicle rivers and the provinces of Gaziantep, Sanliurfa, Adiyaman, Diyarbakir, Mardin, Siirt, Batman and Sirnak, on the plains between the rivers. The project will also bring with it a change in the climate of the area. The Atatürk Dam and Hydroelectric Plant, the largest in Turkey and the sixth largest in the world, is situated on the Firat River in the town of Bozova in Sanliurfa. 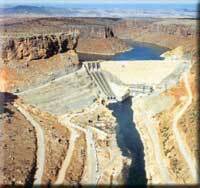 Atatürk Dam, which is the foundation of the Southeastern Anatolia Project, began operation in 1994 and is important not only for energy production but also for irrigation. The water obtained from the reservoirs of the Atatürk Dam will be carried to the Harran plain by the Sanliurfa Tunnel System, which is the largest in the world, in terms of length and rate of flow. The waters of the Firat river will pass through tunnels which are 26.4 kilometres in length and 7.62 meters in diameter, and be distributed to the vast croplands of the southeastern Anatolian plains from central and branch channels, bringing a production boom and prosperity to the region. To explore the sites along Turkey’s southern border, take the highway which connects Gaziantep, Sanliurfa and Mardin to Syria and Iraq. The 36 towers of the city’s fortress were originally constructed in the Justinian era and were later rebuilt by the Seljuks. The Archaeology Museum has important artifacts from Neolithic, Hittite and Roman times. The Hasan Süzer House, from the turn of the century, has been beautifully restored as the Ethnographical Museum. The artisans of Gaziantep specialise in copperware and furniture inlaid with mother-of-pearl. The kitchens there produce some of the best lahmacun, a delicious pizza topped with spicy meat and herbs, and also baklava, a honey and nut pastry. West of Gaziantep, the Dülük Forest makes a good day’s outing, or you can stay overnight in the campsite. In the woods, stroll through the archaeological site which dates back to prehistoric times. A Hittite school of sculpture was centred in Yesemek, where the 200 works of art still reveal the beauty of the Hittite period. Next to the Syrian border, on the banks of the Firat River, Kargamis, once a late Hittite capital, is another important archaeological site. The site’s finds, including immense bas-reliefs, have been moved to the Museum of Anatolian Civilisations in Ankara. Kilis, near the Turkish-Syrian border en route to Gaziantep, was originally known in the Assyrian archives as Kilizi. Kilis is important for its cotton and silk weaving and also for its leather products. This most charming area is dotted with vineyards and olive groves on all sides. Also interesting are the Canbolat Bey complex, the old baths and a center that once housed a dervish order. Several other sites worth seeing nearby include Ravanda Castle, situated between Kilis and Gaziantep. 5 km to the northeast is the town of Kuzeyne (Korus) that is like an open-air museum with its castle and mosaics. What makes it special is that here one can view ruins from Hittite, Roman, Byzantine, and Islamic times all in one place. An ancient Roman center is found 20 km east of Kilis in the town of Korus (Kiriz). Ruins of a castle, a temple and a theatre await your visit. Adiyaman (153 km northeast of Gaziantep) the Archaeological Museum houses regional finds from the Lower Firat which date from the Neolithic and Chalcolithic ages. Good quality kilims woven in bright colours sell for reasonable prices in the bazaar. Surrounding monuments include the ruins of an Abbasid citadel (restored by the Seljuks) and the 14th century Ulu Mosque. The discovery of oil in the region has brought prosperity to Adiyaman. 5 km to the north is Pirin (Perre), that boasts a large Roman necropolis dug out of the rock and soil. Adiyaman, as well as Kahta (which also has good accommodation and camping facilities), make good bases from which to visit Nemrut Dagi (Mt. Nemrut) National Park. You can hire transportation in either town. On the summit of Nemrut Dagi, at 2,150 meters the highest mountain in Northern Mesopotamia, sits the gigantic funerary sanctuary erected in the first century B.C. by King Antiochos I of Commagene. The engineering involved continues to amaze visitors seeing for the first time the artificial tumulus as it is flanked by terraces on which rest the colossal statues of Apollo, Zeus, Heracles, Tyche and Antiochus. Time has inflicted heavy damage on the sculptures – their torsos sit with their beautifully carved heads at their feet. At ancient Eskikale (Arsameia of Nymphaios), a magnificent relief in the ruins of what scholars believe might have been the Commagene Palace depicts Heracles greeting the Commagene king, Mithridates. Opposite this site, separated by the Eski Kahta river, are the remains of Yenikale (New Castle) built by the Mamluks. Other nearby sights include the Roman bridge at Cendere and another Commagene royal tumulus, Karakus. In the great Upper Mesopotamian plain, Sanliurfa, thought by some to be the ancient city of Ur and later known as Edessa, proudly exhibits the legacy of all the civilisations that have prospered in this region. Some of the oldest signs of civilisation, dating to 7000 B.C., were found 70 kilometres northwest of Sanliurfa, at the village of Kantara. The recent development of dams and a hydroelectric plant stand in stark contrast to the ancient site of a temple and Neolithic settlement which is nine thousand years old. The temple has been identified as a religious center for moon worship. This site is still the only one of its kind in the world. Visitors can view small idols and religious figures as well as some very early and beautiful mosaic work from the settlement. On a hill 20 kilometres northeast of Sanliurfa lies Göbekli. This settlement is perhaps 9000 years old, and may rest atop even older settlements in lower layers of the artificial hill. The probable workplace of an ancient idol maker can be seen here where many finished and unfinished human and animal figures and tools have been found. The Sanliurfa area, in the second millennium B.C., was a city of a Hurrite state. Some believe that Abraham was born in a cave near where the Mevlid Halil Mosque now stands. Today the cave is a pilgrimage site and flocks of pigeons do not seem to disturb the elderly men praying around the entrance. The remains of a castle with two lone Corinthian columns rising above the ruined walls stands atop a small crest. At the foot of the hills, the lovely Halil Rahman Mosque is built around a quiet pool in which sacred carp swim. The 17th-century Ottoman Ridvaniye Mosque and the Firfirli Mosque, formerly the Church of the Apostles, are worth a detour. The Archaeology and Ethnography museum, one of the best in Turkey, houses important Neolithic and Chalcolithic finds from the Lower Firat region. To capture the spirit of Sanliurfa, wander through the vaulted eastern bazaar and linger in the courtyards of the old hans (inns). See if you can find Gümrük Hani and Barutçu Hani – the most interesting of the old hans. Believed, to be the ancient city of the same name mentioned in the Old Testament, Harran is known more now for its unusual beehive dwellings than as the place where Abraham actually spent several years of his life. Included among the archaeological are those of the largest ancient Islamic university, city walls dating from the eighth century, four gates and a citadel. The GAP project will transform Harran into one of the most fertile areas in Turkey. Birecik, 80 km west of Sanliurfa, straddles the Firat river and is dominated by the citadel. A good place to take a break, there are good accommodations and camping facilities here. Diyarbakir, known in ancient times as Amida, spreads across a basalt plateau close to the banks of the Dicle river. The black basalt triple walls which encircle the old town give the city a rather ominous appearance. These ramparts are 5.5 km in length, have 16 keeps and five gates, are decorated with inscriptions and bas-reliefs, and represent a superb example of medieval military architecture. The Ulu Mosque, built by the Seljuk sultan Melik Shah, is notable for its original design and for its utilisation of both Byzantine and more ancient architectural materials. The mihrab of the nearby Mesudiye Medrese is made of the local black basalt. The Nebii Mosque represents the typical Ottoman style, while the Safa Mosque exhibits Persian influences in its tiled minaret. The third century Aramaic Church of the Virgin Mary (Meryemana Kilisesi), which is still in use today, also makes for an interesting visit. For an example of early domestic architecture, stop at the restored home of the writer Cahit Sitki Taranci. The Deliller Hani (1527) by the Mardin Gates, convened and refurbished into a hotel, recreates the atmosphere of the days when trading caravans stopped in Diyarbakir. Just outside the city walls, by the river, stands Atatürk’s house, now a museum. South of town at the Dicle Bridge, built in 1065, you can take a great picture of the Dicle River, the bridge and the city walls. In Silvan, 77 km east of Diyarbakir you should stop at the graceful Ulu Mosque, which dates from 1185, to admire the fine flowing lines of stone-relief work that outline the pointed arch portal. Çayönü, one of the earliest Neolithic settlements yet to be discovered, dates from the seventh millennium B.C. 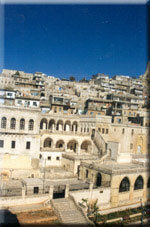 From a distance, the golden stone houses of Mardin blend into the rock of the hills on which the city is built. On closer inspection, the stone carving and decoration of the houses and public buildings reveals the city to be an architectural treasure-chest. Among the jewels are the ancient citadel and several mosques, in particular, Ulu Mosque. The 15th-century Kasim Pasa Medrese is remarkable for its fine stonework. At the lovely Isa Bey Medrese, from the 14th century, you can admire the magnificently carved portal and climb to its roof to enjoy a fantastic view of the Mesopotamian Plain. Only 7 kilometres east of Mardin is the Syriac Jacobite Monastery of Deyrulzaferan, which was once a thriving religious community. At nearby Kiziltepe, the 13th-century Ulu Mosque, one of the best examples of Artukid architecture; has superb mihrab reliefs and a beautiful portal. Midyat, famous for its silver jewellery known as ‘telkari’, also has many elegant and historic houses. Eighteen kilometres east of town is the active Syriac-Jacobite monastery of Deyrelumur (San Gabriel), which dates from the beginning of the fifth century. Batman is Turkey’s most important oil-producing center, with oil wells pumping the precious fuel dotting the surrounding area. North of Batman, the Malabadi Bridge, built in 1147, spans the Batman River. Undisturbed by time, peaceful waters still reflect the widest single-arch bridge of its day. Two guard towers ensured the bridge’s security. Siirt was an especially eminent city at the time of the Abbasid Caliphate. Among the city’s monuments, be sure to visit the 12th century Seljuk Ulu Mosque and the 13th century Asakir Çarsi Mosque. At Aydinlar (Tillo), only 6 km from Siirt, the Ibrahim Hakki Mausoleum Complex and nearby private Ibrahim Hakki Astronomical Museum are worth a visit. Siirt produces fine and large pistachio nuts and is known as well for its excellent goat-hair blankets and kilims.